Scotti's works are housed at the Tretyakov Gallery, the Russian Museum, various other Russian museums, such as those in Petrozavodsk and Irkutsk, as well as in private collections. So why has the public forgotten the artist? During the Soviet era, knowledge of artists with foreign surnames was not encouraged; what is more, a major part of Scotti's oeuvre was made up of icons that he painted for Russian Orthodox churches, most of which had been destroyed. 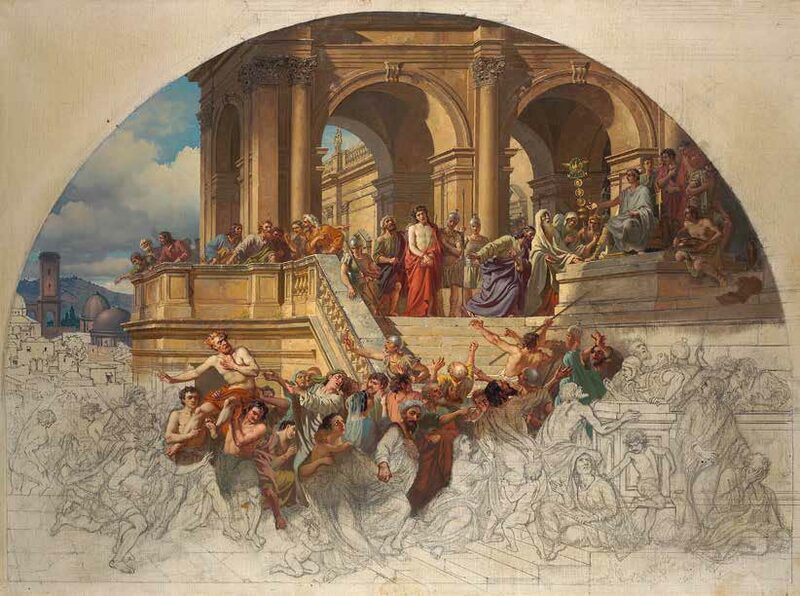 There was also an unspoken prohibition on studying religious art of the 19th century. This author has for several years been working on the first monograph on Mikhail Scotti1, which came about through lucky chance, as often happens in the museum world. In summer 2008, a no-nonsense battle for a small painting by Mikhail Scotti took place at Sotheby's London auction of Russian art2. 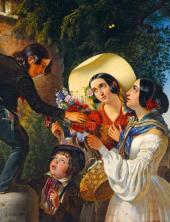 The organizers used a traditional name for the painting, "Italian Scene". I was attending the auction as a consultant, and it occurred to me that there were such a multitude of paintings depicting "Italian scenes" that we needed to somehow "spell out" what was going on in the painting. A poetic name came to mind: "Flowers for the Madonna". The artist painted a truly touching scene. A spirited young boy is helping his mother and sister put up a bouquet of fresh flowers in front of an image of the Madonna in a Florentine street. Scotti shows his characters faithfully, with a touch of humour: a young Italian woman looks devoutly at the Madonna's image, while the boy, with his mouth open, is trying to decide if his "fratello" would fall or go on balancing on top of a stone column. Italians are well known for their veneration of the Madonna; her images can be found everywhere - in the recesses of city walls, on the walls of the houses, even on tree trunks in rural areas. This small painting's simple subject matter, the images of the innocent Italian women in their colourful dresses, and the children's lightheartedness, all attracted the attention of the potential buyers at the London auction. So who was the artist that painted this scene? Nikolai Berg3, Scotti's fellow professor at the Moscow School of Painting, Sculpture and Architecture, wrote about the artist: "Mikhail Scotti was born in Rome, but ended up in Moscow rather early in life, so he became entirely Russian, both in the way he spoke the language and some of his mannerisms. He did, however, speak very good Italian, too. At the core though, he remained Italian, not Russian. He was... a handsome, slender, and tall young man with good manners, a bit introverted. "4 In fact, Scotti was born in St. Petersburg. The records at the Catholic Church of St. Catherine in the "northern capital" of Russia state that, "In the year 1814 A.D. on the 20th day of October, I, Ignaty Petroboni, a Jesuit priest, baptized the infant Michael Angelo Pietro Carlo, born on the 17th day of the same month, to Giovanni Battista Scotti and his lawfully wedded wife Aloisia Tardi. "5 The artist remained a Roman Catholic all his life. The Italian decorator and painter Giovanni Battista Scotti came to Russia at the end of Catherine the Great's reign. He collaborated with the best architects of St. Petersburg, such as Carlo Rossi, Jean-Francois Thomas de Thomon, and Andrei Voronikhin. Lucrative commissions provided for a plentiful life for the artist's family. "Angel Mishenka" (the nickname for Mikhail) grew up in a happy and artistic atmosphere. However, his father's, and soon his mother's sudden deaths immediately changed his life. Having become a citizen of Russia in 1831, Mikhail had to take care of himself and his younger brother; Alexei Yegorov, professor of historical painting at the Imperial Academy of Arts, supported Mikhail, who lived at his family home for a long time. As a student at the Academy, Scotti was quite successful, but did not receive the gold medal or Academy grant to study and work abroad. Nevertheless, his dream of travelling to his ancestral land to study art there did come true - in 1838 he went to Italy with the financial support of his wealthy benefactor, I.D. Shepelev. During his five-year stay in Italy, the artist visited Venice, Florence, and Naples, and met many distinguished artists from various countries who were living in Rome. At the beginning, Scotti was even somewhat intimidated. "It is a bit frightening here, so many masterful artists," he wrote to Shepelev. "Art is subjected to strict criticism. I can say that I have criss-crossed and seen all of Italy, with the exception of Sicily. I have been selling some of my paintings at exhibitions - Italians buy them; I have been living off this income for the past five years. "7 In Rome Scotti became fast friends with the resident Russian artists, and was particularly close to Nikolai Benois, Alexander Rezanov and Alexander Rossi, all three of them architects. In spring (March-July) 1842 Vasily Grigorovich, the administrator of the Imperial Academy of Arts, came to Rome. Grigorovich, who taught art history at the Academy, was loved and respected by the Russian artists living in Rome on the Academy's grants, and they gladly welcomed him to their studios. 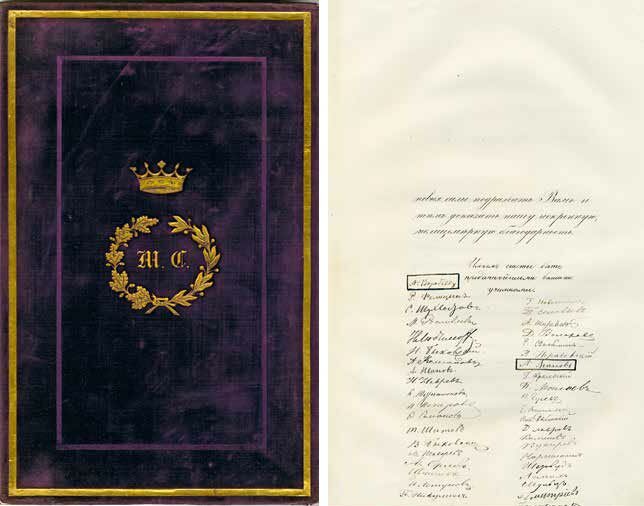 As a result, Grigorovich prepared the detailed "List of Russian Artists and Their Works in Alphabetical Order", which he sent to St. Petersburg, to the Academy's president Alexei Olenin. This valuable document offers great help in verifying information regarding quite a few works that Scotti executed at that time.8 Anna Pogodina (who was the first to publish the document) introduced Scotti's "Portrait of E.A. Karlgoff", which was on Grigorovich's list, into scholarly discourse, even though she did not know the portrait's current location. We were able to find it. Mikhail Scotti's "Portrait of an Unknown Lady in Black" (according to Scotti's inscription, the portrait was executed in Rome in 1842) is at the Russian Museum. A young woman in a low-cut dress is shown against a backdrop of dark red patterned wallpaper. Her stylish ball gown and valuable bracelets on her wrists would seem to indicate that she belonged to high society. At the same time, her sheer black scarf and her covering both signify that she is in mourning. The authors of the Russian Museum catalogue assumed that this was a portrait of Praskovia Kutaisova9 (1784-1870), Ivan Kutaisov's mother - Scotti stayed with Kutaisov's family in Florence and painted Count Kutaisov's portrait with his children (the work is also in the Russian Museum). However, Praskovia Kutaisova had remained in Russia. Besides, the widow would have been more than 60 years old at the time when Scotti painted his portrait, and the woman in it looks much younger. We believe that the woman in the portrait is indeed Elizaveta Karlgoff, whose biography supports our hypothesis. Elizaveta Ashanina (Oshanina) (1817-1884) came from a family of Penza gentry in the centre of Russia. Following the death of her father, she and her mother moved to Moscow, where she met Wilhelm Karlgoff (1796-1841), a major-general and a man of letters, at the home of her family's "old friend" Yury Bartenev. The German baron was more than 20 years older than Elizaveta. In 1833, Elizaveta's mother died, and a year later the young woman married Karlgoff, who "took the place of everyone and everything". The married couple settled in St. Petersburg, and Karlgoff introduced his young wife into Russian literary circles. Vasily Zhukovsky, Pyotr Vyazemsky, Ivan Krylov and Matvei Voyeikov were all frequent guests at the couple's hospitable home. Once, Elizaveta Karlgoff hosted a dinner in honour of Denis Davydov, and her idol, the poet Alexander Pushkin, attended. In 1833 Karlgoff was appointed Trustee of Education Precincts, and the family moved first to Kiev and later to Odessa. From then on, Elizaveta Karlgoff began to publish translations, essays, and articles in various periodicals. In 1841 Wilhelm Karlgoff died in Odessa of tuberculosis of the throat. To dull the pain of her loss, the baroness Karlgoff decided to travel abroad and joined the Vasilchikov family on their journey to Italy, France, Germany, Holland and Belgium. She kept a diary throughout the trip. Elizaveta Karlgoff returned to Russia in 1843, and in 1847 married Alexander Drashusov, a professor of physics and astronomy at Moscow University. From that point onward Elizaveta Drashusova published her writings regularly, in "Biblioteka Dlya Chteniya" (The Reader's Library), "Biblioteka Dlya Vospitaniya" (The Early Education Library), "Sovremennik" (The Contemporary), and "Russky Vestnik" (The Russian Herald). She was also an active participant in"Mosskovsky Gorodskoy Listok" (The Moscow City Leaflet), which published both her essays and her translation of "Pictures from Italy" by Charles Dickens. 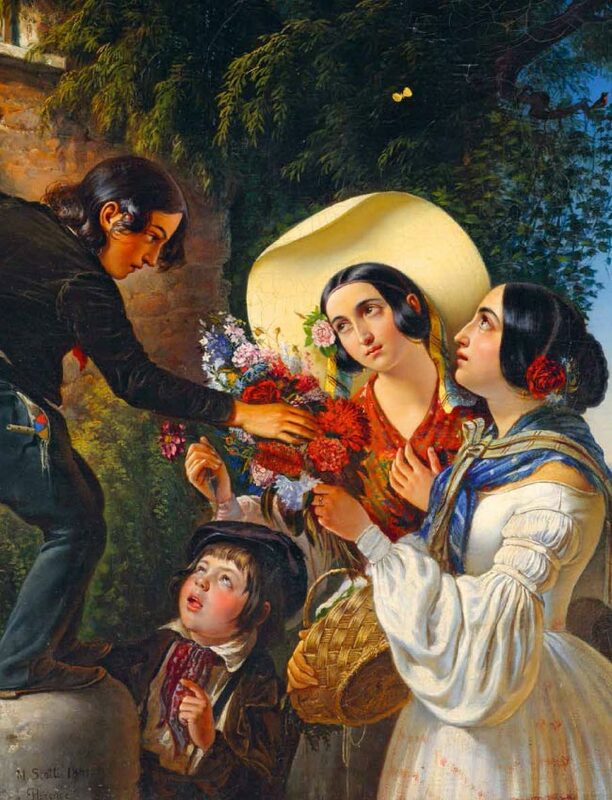 During the visit of Grand Duchess Maria Nikolaievna to Rome on March 5 (17 by the Old Style) 1843, the Russian artists living there on grants from the Academy organized an exhibition of their work. According to archival documents, Mikhail Scotti showed four paintings, "Interior of the Basilica of St. Francis of Assisi", "Church Interior", "Architectural View of Ca' d'Oro (Palazzo Santa Sofia) in Venice", and a certain "Portrait"11. It may have been the "Portrait of E.A. Karlgoff". This publication is the first to print Scotti's self-portrait in carnival costume. 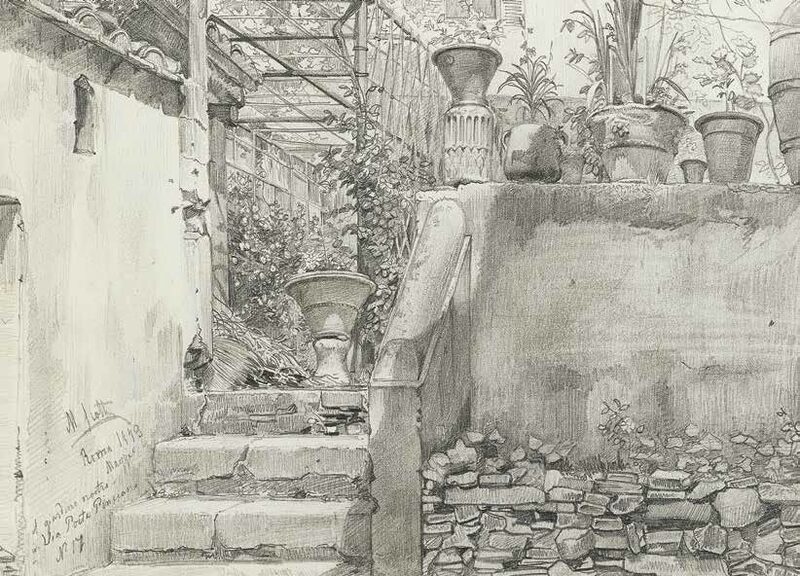 The artist's rather extensive correspondence abounds with vivid descriptions of historical sites, opera performances, and pointed descriptions of his contemporaries; sometimes he illustrates his narratives with ink or watercolour drawings. 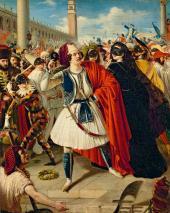 Scotti was especially fond of the so-called "German Carnival", which was celebrated on May 1. A motley crowd of young artists got together at the ancient quarry at Cerbara, which according to Roman myth was the home of the nymph Egeria. German artists were the "instigators" of these festivities, when a "boys' night out" was followed by an inescapable feast, playful competitions, and awards that mocked academic ceremonies. Starting from 1832 the traditionally "German festival" began to include artists from other countries. 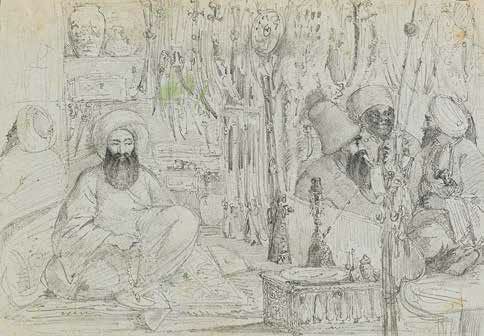 In 1838 there were 148 participants, among them Fyodor Jordan, an engraver. In 1839 Nikolai Gogol was an honorary guest at the "Cerbarafest". In 1842 even "the great recluse" Alexander Ivanov"graced" the event, and not only with his mere presence - he served as "the great cup-bearer". The writer Matvei Bibikov also attended the "carnival-feast"13 and described it in one of his stories; thus, in remembrance of the Cerbara festivities of 1843, Scotti painted Bibikov's portrait in a 17th-century costume. 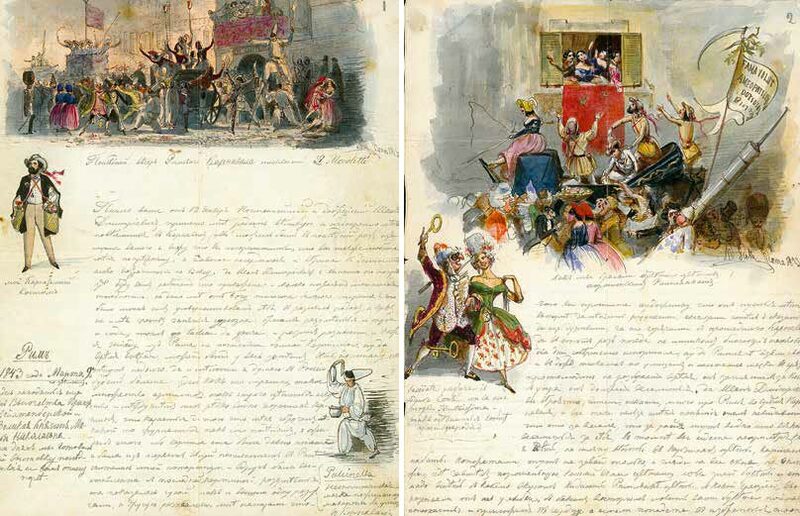 Scotti's friends, the architects, came up with the idea to prepare a humorous album (dated December 26 1843/January 7 1844) of watercolour drawings as a gift for Pavel Krivtsov, the official in charge of the Russian "artistic colony" in Rome. 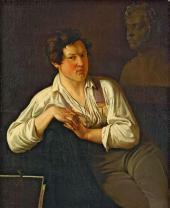 Nikolai Benois, Mikhail Scotti and Vasily Stenberg drew affectionate caricatures of each member of the colony, depicting something unique about their lives in Rome and making fun of their vices and shortcomings. 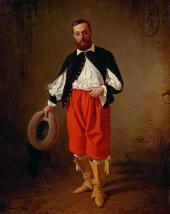 Among others, this quick-witted portrait gallery contained Benois' humorous caricature of Scotti14. Scotti's contemporaries recalled "sweet Michelangelo's" happy disposition that allowed him to make friends so easily, and with all sorts of people. It also highlighted his friend's characteristic penchant for doing several things at the same time: the artist's studio was filled with people - Italian women who modeled for him, a Capuchin priest, a merchant selling picture frames. The owner of the studio is depicted in front of his easel, painting with one hand, and writing a letter to his beloved Marie with the other one. 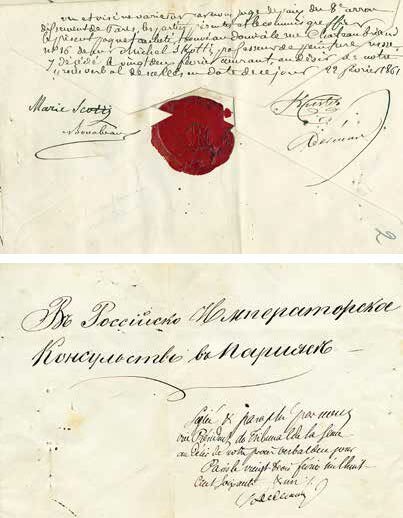 In January 1844 Mikhail Scotti returned to St. Petersburg. He received a lucrative commission to paint icons for the church at the Russian Embassy in Constantinople, and left for "the city of emperors". During his visit to Turkey, Scotti drew numerous watercolours with lively "oriental" scenes, such as "Cafe in Constantinople" (1844), "At the Fountain" (1845), and "A Harem" (1845, all at the Tretyakov Gallery). 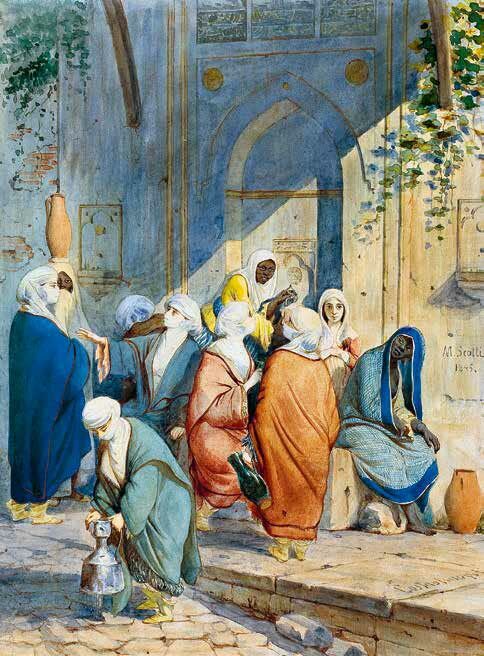 Coming as he did from Europe, Scotti revealed his curiosity about Turkish life in a series of images: dervishes swirling ecstatically; a group of silent, motionless men smoking their hookahs; graceful Turkish women is their national dress. With great humour Scotti depicted scenes from a barbershop or a local store. 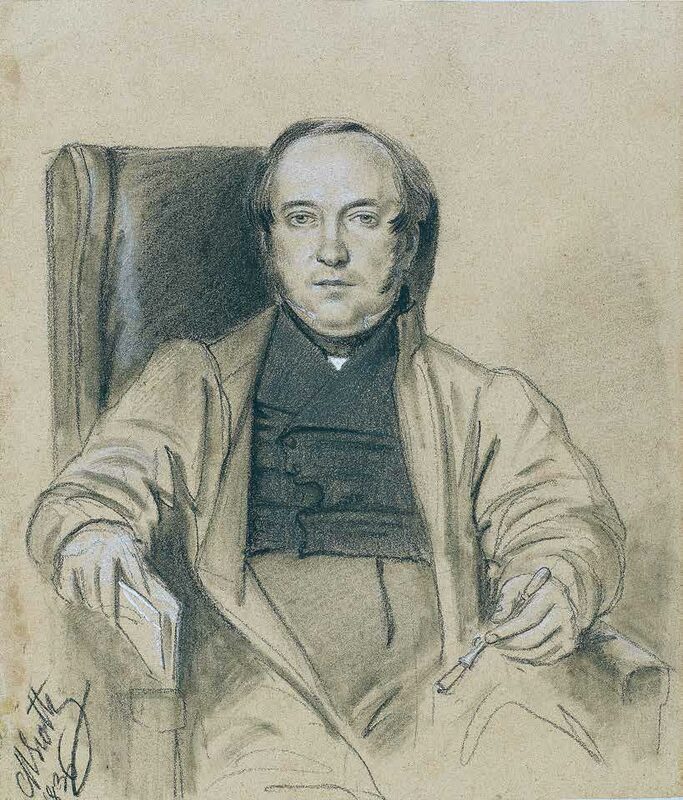 It was in large measure due to these water-colours that in 1845 the Imperial Academy of Arts decided to "bestow on M. Scotti the rank of an Academician in recognition of his contributions to historical and watercolour painting, as they are known to the Academy". Scotti worked at the Moscow school for six years. During his tenure the quality of instruction changed in many respects, and teaching methods were diversified; the required educational materials, tutorials and textbooks supported the teaching process much more effectively. The school gained the reputation of an educational institution that prepared its students to enter the Imperial Academy of Arts, a circumstance that attracted many talented young people whose goal was to continue their education at the Academy; it also made the school a prestigious institution for which to work. While living in Moscow, Scotti joined the circle of patriotic historians, writers and artists. In December 1850 he wrote to Grigorovich that he was working on paintings "for Count Lobkov's Russian-style study, one [depicting] Minin as he leads Pozharsky into battle, another - Susanin's death, and a third one of Avraamy Palitsyn. "22 The paintings were intended for Alexei Lobkov's23 residence on Pokrovka; studies for these compositions may be found in the album of Scotti's drawings housed at the Tretyakov Gallery. The finished paintings clearly reveal the artist's passion for the theatre: the way the figures are positioned alludes to stage settings, and characters are rendered through well-developed archetypes (a hero, a wise man, a righteous one). The faces attract attention on these rather small canvases: the beauty of their feelings is transformed into moral fortitude that is capable of resisting danger, evil, fate, and natural disaster. The emotional intensity of narrative, passionate rendering of the characters' feelings and their inner turmoil is characteristic of such romantic perceptions of historical events. 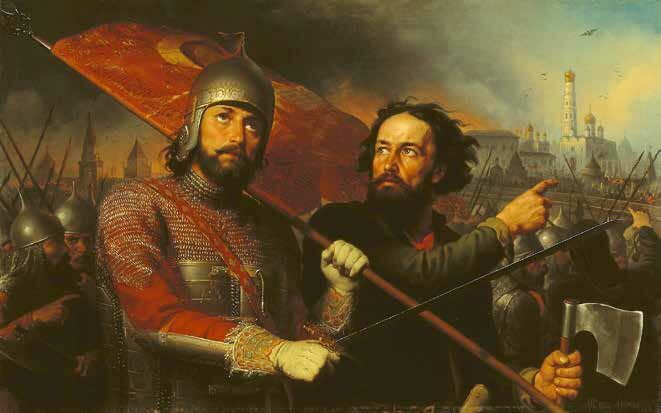 Scotti was also working on a demanding commission at the time - he painted 57 icons for the Church of St. Myron of the Yegersky Guards Regiment in St. Petersburg. In recognition of this work, in autumn 1855 the artist received the title of Professor of Historical Painting. But years of intense work, both as an artist and educator, had ruined Scotti's health. In November 1855 he was compelled to leave his position at the Moscow school "due to an illness of the eyes". On January 1 1856, the school said farewell to its beloved professor, who was leaving for his "blessed" Italy. The parting evening was marked by solemn speeches, poetry readings and addresses in prose. The "most devoted" students presented Scotti with an address bound in purple velvet and embossed with gold.24 Scotti's former students wrote: "To our most esteemed mentor... Your name lives in our hearts along with the understanding of the arts, to which you opened the door for us. Your work and your passionate love for the arts will serve as an example for us to never shy away from hard work but rather learn to love it, find happiness in it, carry on with courage and always perform our duties." Forty students signed the address.25 The list of Scotti's students who went on to become famous artists includes such names as Nikolai Nevrev, Stepan Shukhvostov, and Vasily Pukirev. Others also contributed to the development of the Moscow school, among them Konstantin Herz, Pyotr Moiseev, Mikhail Gribkov, Pavel Desyatov, and Kapiton Turchinov. 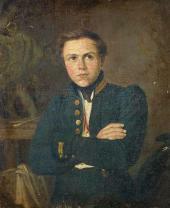 Nikolai Bykovsky26, Scotti's most devoted student, accompanied him on the trip to Italy. Scotti spent the last few years of his life abroad, and little was known about that time in Russia. There were some rather unpleasant rumours. Thus, Nikolai Berg wrote, "Having increased his capital to the desired level, M.I. Scotti left Moscow and soon expired somewhere (maybe in Florence) as a result of certain excesses... well, it was not hard to resist. Italian women loved him so much, and he was so alluring! "27 In reality, the artist succumbed to an aggressive form of cancer. Scotti wrote about it in a letter (mailed from Rome on August 28 1860) to Konstantin Bykovsky, a Moscow architect: "I endured much suffering; the disease lasted for more than six months, and I was just recently operated on... just to think what danger I was in, that I could have bled to death - part of my tongue was cut out, and it was thanks to the famous surgeon Mazzoni that the surgery was done exceptionally well - it [the surgery] was written up in a medical journal. "28 Unfortunately, Scotti's hopes of being cured and regaining his strength proved in vain. The artist spent the rest of 1869 in Milan, and then traveled to France, accompanied by the faithful Maria Dementievna and Nikolai Bykovsky. The erroneous opinion that Scotti was buried at the Pere-Lachaise cemetery in Paris31 has taken root in professional publications. 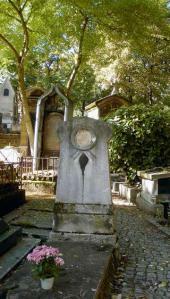 However, an inquiry by Russian experts and the answer they received from the cemetery's administration proved that Scotti was not buried there.32 Thanks to the efforts of Natalya Kapyrina, the artist's grave was discovered at the Montmartre cemetery, and the process of its demolition was disrupted. The photograph of Mikhail Scotti's burial site that is published here for the first time shows clearly how dilapidated the grave is, and how urgent the need is for its restoration. We hope that the year of the bicentenary of Scotti's birth becomes the year when his grave will be repaired. This could be our offering to the wonderful memory of this artist - an Italian by birth and a Russian patriot, whose final resting place is on French soil. Markina, Lyudmila. 'I Did My Best to Improve Myself' //"Our Heritage". 2011. No. 97, p. 25-33; Markina, L.A. "Themes from Russian History in the Oeuvre of'the Russian Italian' M.I. Scotti" // Russian Academy of Sciences. Institute of Russian History "A Friend is a Mirror to His Friend..." Russian-Italian Cultural and Social Ties, 10th-20th Centuries. Moscow, 2013, p. 231-243; Markina, L.A. 'Album of Drawings by M.I. Scotti from the Collection of the Tretyakov Gallery' //"Lectures at the Tretyakov 2013. Materials from Research Conference. Moscow", 2014. Pp. 107-117. Sotheby's Russian Art Paintings, London. 10 June 2008. P. 36. Lot number 121. Nikolai Berg (1823-1884) was a poet, translator, journalist, and historian. Berg taught the Russian language at the Moscow School of Painting, Sculpture and Architecture (before 1849.) From 1868 he worked as a Russian grammar instructor at the main school of Warsaw; gave lectures on the Russian language at the Warsaw University until his death in 1884. In 1874-1877 was the editor of the newspaper "Varshavsky Dnevnik" (The Warsaw Journal); wrote for the magazines"Russkaya Starina" (Russian Antiquity) and"Istorichesky Vestnik" (Historical Herald). РГИА. F. 789. Inventory1. P. 2, item 1533, sheet 34. Benois, A. N. "My Memoirs". Moscow, 1990. P. 50-51. Knyaseva, N.A. 'Artists and Philanthropists from Vyksa' //"Moskovsky Zhurnal" (Moscow Journal). 200. No. 2. P. 63-64. Pogodina, A.A. 'V.I. Grigorovich in Rome in 1842. History of the Russian Artists Colony in Rome' //"Lectures at the Tretyakov 2012. Materials from Research Conference. Moscow", 2013. P. 88. Praskovia Kutaisova's husband died on March 9 1840. 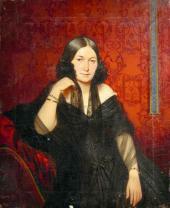 A widow was allowed to wear a black dress with light-coloured trimming and jewellery during her second or third year of widowhood. A comparison with a well-known portrait of Kutaisova does not contradict our attribution. Russian Museum. First half of the 19th century. Catalogue K-Я. F. 3. St. Petersburg, 2007. P. 138. Drashusova, E.A. 'Life is Not a Walk Across a Field. Notes by Anonymous' // "Russki Vestnik" (The Russian Herald). Moscow, 1882. F. 159, May. Pp. 293-294. 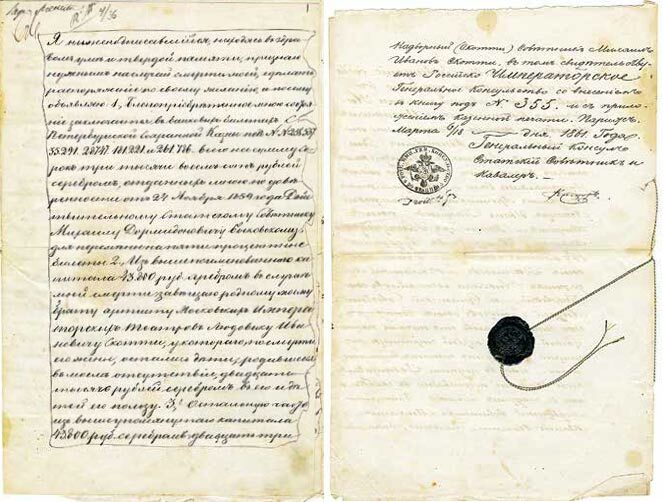 Archives of the Russian Empire Foreign Affairs. F. 190. Inventory 525, item 586, part 1, sheet 470 (reverse). 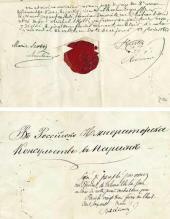 Letter of March 9 1843 from M. I. Scotti in Rome to I.D. Shepelev in Vyksa // Russian Archive of Literature and Art. F. 1348. Inventory 2, item 167, sheet 1. Bibikov, M.P. 'Carnival in Cerbara' //"Moskovityanin" (Muscovite). 1853. #5, part 8. P. 8. Tretyakov Gallery Catalogue. 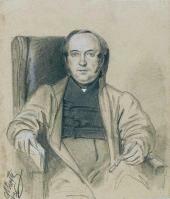 19th-century Drawing. F. 2. Volume 1, A-B. Moscow, 2007. P. 127. 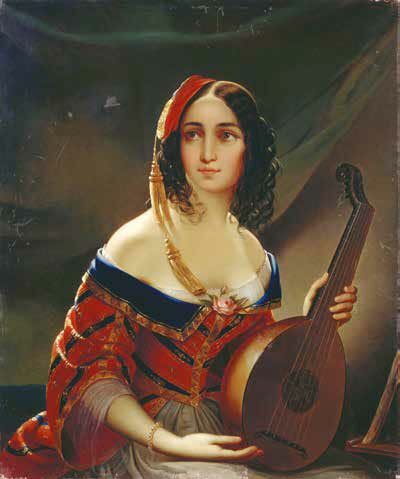 Fyodor Semyonovich Zavialov (1810-1856), historical painter, portraitist. Zavialov and Scotti were both students of A.E. Yegorov. In 1837-1843 Zavialov studied in Italy; in 1844 he was awarded the title of Academician and appointed an inspector and began teaching at the Moscow School of Painting, Sculpture and Architecture. In 1853 he was given the title of professor. Ivan Grigorievich Senyavin (1801-1851) was serving as the Moscow Governor when he was elected an Honorary as well as Board Member of the Moscow Society for the Arts. He continued serving the Society for the Arts after he resigned as the Moscow Governor; even though he lived in St. Petersburg for the last years of his life, he remained on the Society's Board until he committed suicide. Russian Archive of Literature and Art. F. 680. Inventory 1, item 38, sheet 41. Russian Archive of Literature and Art. F. 680. Inventory 1, item 100, sheet 2. Russian Archive of Literature and Art. F. 680. Inventory 1, item 100, sheet 4. Russian Archive of Literature and Art. F. 680. Inventory 1, item 100, sheet 23. Jordan, F. "Notes". Moscow, 1918. P. 189. Manuscripts Department, Russian National Library. F. 124, item 3996, sheet 1-2 (reverse). The paintings referred to are"Ivan Susanin" (1851, private collection), "Dionysius Presents the Charter" (1851, Trinity- St. Sergius Lavra Museum), "Avraamy Palitsyn" (current location unknown). The Tretyakov Gallery album of the artist's drawings includes some sketches and preliminary drawings for these compositions. Alexei Ivanovich Lobkov (1813-1868) was a Board Member and Treasurer of the Moscow School of Painting, Sculpture and Architecture in 1846-1850. A man of considerable personal wealth, he donated significant sums to religious and other charities; he had a passion for archaeology, and was a friend and correspondent of Metropolitan Philaret. Manuscripts Department, Tretyakov Gallery. F. 4, item 31, sheet 1-3. A. Vorobiev (in black frame), R. Felitsyn, C. Shukhvostov, M. Roslavlev, N. Lubimov, N. Bykovsky, A. Kolleganov, A. Ivanov, N. Nevrev, K. Turchaninov, P. Petrov, F. Osmakov, T Shytov, V. Bykovsky, V. Tokorev, A. Orlov, Tsvetaev, I. Letunov, P. Nikulin, G. Novikov, P. Soloviev, A. Shprevich, D. Volkov, E. Ob (illegible), N. Neradovsky, L. Manov (in black frame), G. Krasovsky, P. Moiseev, V. Gusev, E. Vi (illegible), Nik. Dybinsky, D. Lavrov, Kamenev, Pukirev, Naryshkin, Sherwood, Lemoch, Schultz, Dmitriev, Golovanov. Nikolai Mikhailovich Bykovsky (1834-1919) was the older son of the architect M.D. Bykovsky. A student at the Moscow School of Painting, Sculpture and Architecture, he was awarded a silver medal of 2nd degree by the Imperial Academy of Fine Arts, and in 1857 the title of independent artist. Bykovsky attended classes at the Imperial Academy of Fine Arts, and in 1864 was awarded the title of a class artist of the 3rd degree for the painting "Margarita in Church", and in 1867 the title of Academician of Historical Painting for his canvas "A Scene from the Home Life of a 17th-century Musician". 'Nikolai Vasilievich Berg's Memories of Moscow' (1845-1855) // "Russkaya Starina" (Russian Antiquity). 1884. T. XLII. Issues 4-6. P. 641. From M.D. Bykovsky's personal archive; published here for the first time. The author would like to thank Alexei Parmenov for making the publication possible. This letter from M.I. Scotti in Paris to M.D. Bykovsky of January 2 1861 is published here for the first time. From M.D. Bykovsky's personal archive. The author would like to thank Alexei Parmenov for making the publication possible. Translation by N. Kapyrina. Manuscripts Department, Tretyakov Gallery. F. 4, item 36. Antonov, V.V. 'A Forgotten Master' //"Moskovsky Zhurnal" (Moscow Journal). 2014. No. 1. P. 40. The author would like to thank Doctor of History, Professor Anna Semyonova for the information she kindly shared.